ARE THERE ANY OTHER REASONS TO SUPPORT ANWAR..? NO..PKR SARAWAK WANTS ANWAR TO COME AS MENTERI BESAR SELANGOR TO CAMPAIGN IN PRU11 SARAWAK … ITS A WIN-WIN SITUATION FOR PKR SARAWAK..
ANWAR..NO APOLOGY JUST CHASTISED YOUR YOUTH..?? Oops! Anwar Did It Again! While Malaysians are still quarrelling over kangkungs and religious words, a travesty that almost went unnoticed is Anwar’s manipulative press statement that blamed the Malaysian Foreign Ministry for his denial of entry to Japan yesterday. In its usual attention-seeking tradition, PKR today demanded Putrajaya rescind an unwarranted report on Datuk Seri Anwar Ibrahim allegedly sent to the Japanese government and which prevented the opposition leader’s entry into Tokyo yesterday. Anwar claims he had been invited by Nippon Foundation chair Yohei Sasakawa to present a paper on Muslim Democrats. This is the second invitation since he first went there on April 19, 2011. 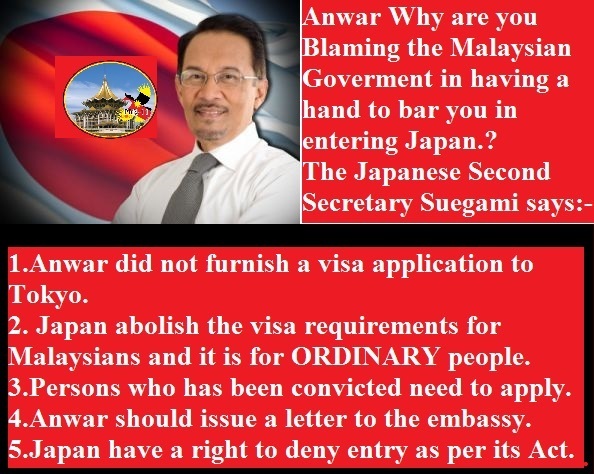 Foreign Affairs Minister Datuk Seri Anifah Aman denied Anwar’s allegation that Wisma Putra had a hand in barring him entry into Japan. He clarified that under Japan’s Immigration Control and Refugee Recognition Act, the Japanese government had the right to deny entry to any person who had been previously convicted or imprisoned in either Japan or any other country. What lurks behind this seemingly innocent denial of entry that compelled Anwar to create such an outcry over this ban? Simple. Anwar failed to tell us that his host, Yohei Sasakawa, is the son of Sasakawa Ryoichi – the creator of the gambling industry that we know today. Imprisoned as a Class A war criminal after World War II, Sasakawa is viewed with hostility by intellectuals internationally. Most importantly, Sasakawa is the founder of the Yakuza in Japan. The Yakuza or gokudo is the world’s largest criminal organization and represent transnational organized crime syndicates in Japan. As depicted in movies, the Yakuza are notorious for their strict codes of conduct and very organized nature. Hence, the Japanese media carry stories about Yakuza who operate internationally with an estimated 103,000 members. 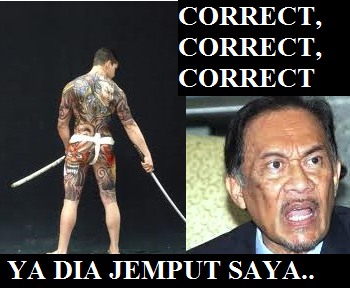 Now, what is the TRUE reason Anwar wanted to go to Japan so desperately? Could there be a hidden link to the Yasukuni Shrine controversy? After WW2, arrest orders were given for 126 Japanese suspects on Class-A (crime against peace) charges and this was narrowed to 14. Of those who were released without charge included Kishi Nobusuke (Abe Shinzo’s grandfather) and Sasakawa Ryoichi who promoted the anti-communist alliance with the United States. The Yasukuni Shrine claims to host the deified souls of military personnel who lost their lives in service to the nation. The controversy arose after 1978 when the new chief priest of the Yasukunia added 14 wartime military and civilian leaders who were executed as Class A criminals by decisions of the Tokyo War Crimes Tribunal or who died during imprisonment to the list of souls enshrined at the shrine. Many Japanese doubt the legal, ethical, and factual legitimacy of the tribunal hence any Japanese political leader’s visit to the shrine (such as Japanese PM Abe Shinzo’s visit in December 26 visit last year) triggers much criticism. Yoichi Sato, a professor of international strategic studies at Ritsumeikan Asia Pacific University, wrote The Yasukuni Puzzle which sheds more light on the deep implications of the Yasukuni controversy. You can download it here. Once you read the paper, you will begin to understand why the Japanese government does not want Anwar to visit Japan to be in the company of prominent personalities. Do not fall for Anwar’s lies.